The Roman Forum was a series of linked online improvisations and stage events centered on the 2000 Democratic National Convention (Aug. 11-19) and set against the backdrop of Imperial Rome. This neo-Vaudevillean exploration of the roots of the American political spectacle built on the idea that we are still Roman in our heads, especially when it comes to politics: in our notions of civic virtue, the particular types of corruption our system is prey to, and our imperial attitude towards the rest of the world. Each morning during the Convention, The Roman Forum began with a live online improvisation conducted by the Plaintext Players in which five ancient Romans responded to unfolding events of the week. The text generated during this improvisation was instantly adapted into a script and given to a group of five stage actors to rehearse. That night, the new script (together with a large amount of other material) was presented as a unique stage event at Side Street Live in downtown Los Angeles. 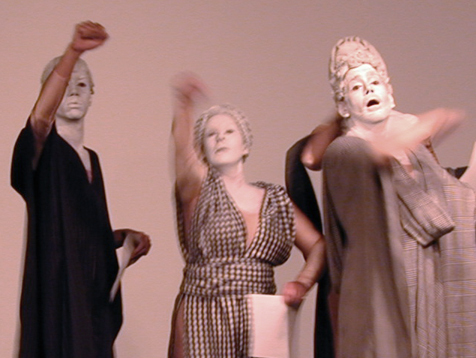 Material from each night's performance was videotaped and uploaded to the web during the week of the Convention for viewing worldwide. By chance, it turned out that the most eventful period of the 2000 elections took place after the voting was over, beginning with the infamous 37 days without a president-elect. The result was a sequel which eventually saw light as The Roman Forum Project 2003.